The hypothesis of financial instability was developed by economist Hyman Minksy. He argued that financial crisis are endemic in capitalism because periods of economic prosperity encouraged borrowers and lender to be progressively reckless. This excess optimism creates financial bubbles and the later busts. Therefore, capitalism is prone to move from periods of financial stability to instability. This is a type of market failure and needs government regulation. Economic stability itself breads instability. Since the credit crisis, many have looked back at the Great Moderation (a prolonged period of economic growth during the 1990s and 2000s) had examined how it contributed to complacency and risk-taking. Traditionally, bank lending is secured against assets. The lending is hedged against default. For example, banks lend mortgages if people can raise a deposit and can maintain mortgage payments to repay both the capital and interest. Typically banks would also check strict lending criteria to make sure the mortgage is affordable. However, if house prices rise and there is economic growth, both lenders are borrowers become more optimistic and willing to take on greater risks. Banks insist on smaller deposits and are willing to lend bigger multiples of income. The greater lending itself causes asset prices to rise and this increases confidence even further. People keep expecting rising prices – the past becomes the guide to the future. We could term these sentiments as ‘Irrational exuberance‘ There is a feeling that the crowd can’t be wrong. If everyone expects asset prices to keep rising, it’s easy to jump on the bandwagon. 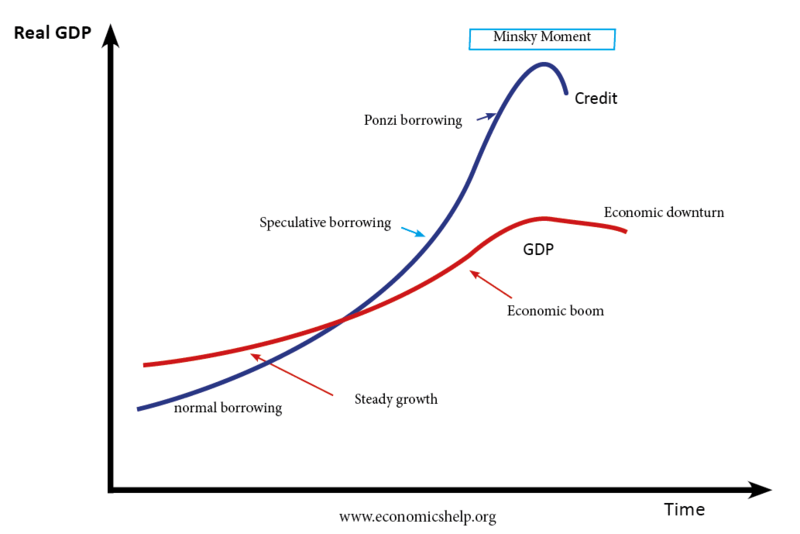 Rather than hedge borrowing (safe secured lending) we see a growth of speculative lending and even ‘Ponzi borrowing’. This means banks and financial institutions lend money in the hope that asset prices keep rising to enable repayment. However, the loans of a Ponzi nature are unsustainable in the long term. Regulatory capture. Regulators who should be insisting on safe lending levels also get caught up in the irrational exuberance. Credit rating agencies make mistakes in allowing speculative and Ponzi borrowing. However, this asset bubble and speculative lending cannot be maintained forever. It is based on the unreasonable expectation that asset prices keep rising beyond their real value. When asset prices stop rising, borrowers and lenders realise their position has left them short – they don’t have enough cash to meet their repayments. Everyone tries liquidity their assets to meet their borrowing requirements. This leads to a loss of confidence and credit crunch. Regulation to prevent speculative and Ponzi lending. Requirements banks keep a certain liquidity in cash reserves. Requiring banks to contribute to a stability fund during boom years, which is to be used in times of crisis. Strict requirements for mortgage lending, i.e. not allowing self-certification mortgages, interest-only mortgages e.t.c. Willingness to act on asset price inflation, e.g. raising interest rates if there is excess house price inflation. Splitting up banks between traditional saving divisions and more risky investment banking. A strong Central Bank willing to act as lender of last resort. The work of Hyman Minsky was largely ignored by mainstream economics in the 1970s and 1980s. Instead, there was widespread support for financial deregulation. But, the credit crisis of 2007 onwards understandably created renewed interest in his work. The model seemed to offer a considerable explanation for elements of the credit crisis. The increase in asset prices (especially house prices) above long-term price to income ratios. The growth of confidence in rising asset prices and continued economic growth. The belief we had seen the end of the boom and bust cycle. The failure of credit rating agencies to adequately see the risk in mortgage debt bundles. The willingness of commercial banks to borrow money on money markets to enable more profitable lending. A culture of risk-taking emerging in banks, with high rewards for rapid growth. Government regulation of financial markets is often more difficult in practice than theory. Financial firms have ways of avoiding government regulation. Financial instability is not the only cause of the 2008 crisis. For example, we had a prolonged growth in total debt levels, there was evidence of global imbalances, with large current account deficits in US, UK and Europe.